The current honour roll has a "Baringhup Boys" section at the bottom of it. This is from a different honour roll and is not an integral piece of the Baringhup School and District Honour Roll. It was part of a separate honour roll that was badly damaged either by a fire or flooding, and the cap piece was the only section recovered. Despite the inclement weather there was a good attendance at the Library Hall on Wednesday night when a most successful concert, supper and dance was held, the proceeds being devoted to the school British Red Cross funds. An honor roll in connection with the Baringhup State School, in memory of the soldiers from the district, was also unveiled. Cr Bryant presided in a capable manner, and the programme was one of the best given here for some time, the items by the school children being much appreciated, showing that they had been well and carefully trained by the head teacher (Mr. Jas Moore), and a number of ladies who willingly assisted him and the committee are also deserving of praise for their work. Maldon News (Vic), 31 August 1917. The State school honor roll which was recently unveiled by Cr. Bryant is a splendid design and of very fine workmanship; it is made of fiddle back panels - and black wood mountings, the names being written in gold letters on the panels. The board, without the headline space is 3ft 6in square, and was built by Mr Allett, of Brighton, It is a fine asset to the school both from a decorative point of view and of patriotic example set by the old school boys. 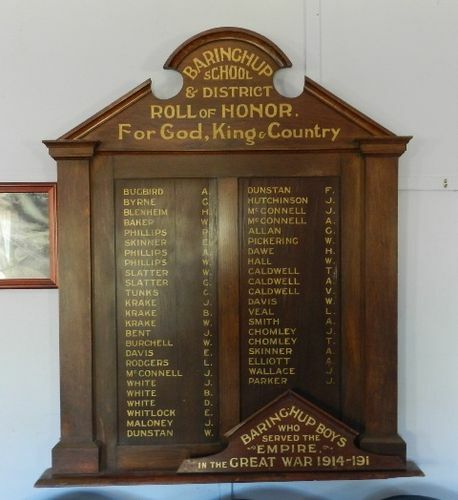 The heading reads— " Baringhup School and District Roll of Honor, for God, King and Country." Maldon News (Vic), 18 September 1917.